Imagine this … being able to get up close and personal with native animals in a wildlife sanctuary, being guided through activities at a working farm on Churchill Island, an educational and interactive experience on the island's newest attraction "Antarctic Journey" and finally, witnessing the star attraction ... Little Penguins waddling in from the ocean to return to their burrows. 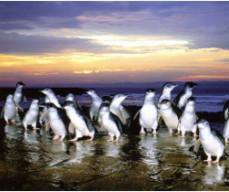 It is this nightly ritual of the Penguin Parade that has drawn so many visitors to Phillip Island Nature Parks and once you have seen it, you have to admit that it is a very special event to witness. Try your hand at milking a cow! The Penguin Parade is a natural phenomenon taking place in the open outdoors.